However, the strange thing is that a lot of those same people completely ignore modern house signs or house numbers for their home. There is another old saying - spoiling the ship for a ha’porth of tar – and really, nothing could be more true than when you go to all that trouble with the front garden and still have a tatty old house number on the wall. Of course, some homes, although they may technically have a street number, are known by their name, perhaps something like The Old Vicarage. It is amazing how often people seem to move into a home that has a name sign on the front that has been there for donkey’s years, spend ages on the garden, and still leave the old sign up on the wall, when for the sake of a few pounds they could have a brand spanking new house sign. At Contemporary Heaven we can produce house numbers and house signs in a wide range of different formats through our associate company Roco Verre. These signs are crafted especially for us and our customers and are not available anywhere else. The house numbers are available in a wide choice of different colours and can be produced in two sizes. They can be square or round, and there are five different fonts available from which to choose. They provide your home with a unique look and will welcome your visitors. 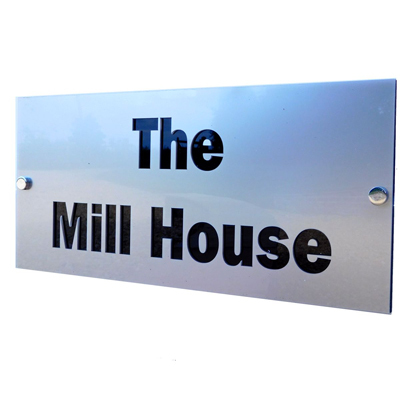 The house signs are manufactured at the factory to order and come in 8 acrylic colours - gloss white, gloss black, gloss silver, mirror, gloss brass, gloss orange, gloss red, and the very popular matt black which has a slate look about it. So if your home still has an old house number or sign on it, give it that finishing touch by ordering a bespoke one from us.